Moscow State University Board of Trustees meeting. Putin.BLOG Education Universities Moscow State University Board of Trustees meeting. Excerpts from transcript of Moscow State University Board of Trustees meeting. [Rector of MGU] Mr. Sadovnichy said that the university school has started work and its students have already gone to the Sirius Centre in Sochi, where they attended lectures by scientists, business representatives and other prominent and interesting people who have achieved exceptional results in their fields of activity. Mr. President, thank you for these congratulations and for these warm words about the university. Mr. President, as we discussed earlier, we opened another school on a new site here on September 1. The school has 6 buildings and unique infrastructure, and talented children from around the country are studying there now. We held several selection stages. During the final stage, they went through a preparatory course at the Sirius Educational Centre. We are sure that this new university-affiliated school will soon become the school of the future. I must mention too our excellent branch in Sevastopol. It was established in 1999. Back then, I indicated from on board the Moskva cruiser a part of the branch that had just opened, Mr. President. There were difficulties in branch’s work in the past, but now it is one of the best universities in southern Russia with a very good infrastructure. They currently have 700 students from Crimea, Sevastopol and other Russian regions. One of the teachers has the highest h-index [Hirsch index ranking for citation of publications] in Crimea and Sevastopol. In other words, they have good teachers there. Finally, I would like to bring up a very important matter (Mr. President has already raised it). We continue to develop new territory. This refers to our scientific-technological valley. We have already built about 1 million square metres of new space in the new territory and during these 10–12 years we have doubled our campus [area]. Previously, 1 million [square metres] were built. We have doubled that. Members of the supervisory board have corresponding materials, photos of training facilities, labs and buildings. We have done a lot of work on the concept of our further territorial development. Seven main areas or clusters were identified. They correspond to scientific development clusters in Russia. This concept was approved by the academic council. It calls for the development of the country’s priority areas in science and technology. New-generation training and research facilities, labs, dormitories, sports facilities and other infrastructure will be built. The project has been finalised. I cannot name them all – there is simply no time for that, but I thank all those who have taken the initiative to establish corporate departments at Moscow University to train personnel for their corporations: Mikhail Gutseriyev, Vladimir Yevtushenkov and Oleg Deripaska. I would particularly like to thank Igor Sechin for his constant assistance, as well as Nikolai Tokarev, Sergei Chemezov, Grigory Berezkin, Oleg Grigor and of course, Sergei Sobyanin. I am certainly grateful to all the Board of Trustees members for supporting the university’s development. 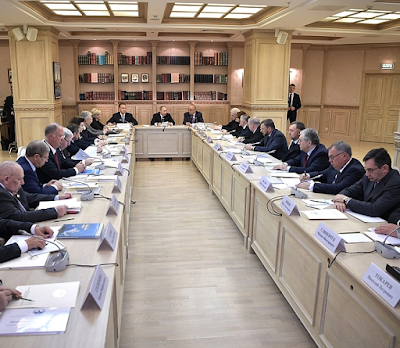 Vladimir Putin at the Moscow State University Board of Trustees meeting. 0 Comment to "Moscow State University Board of Trustees meeting."